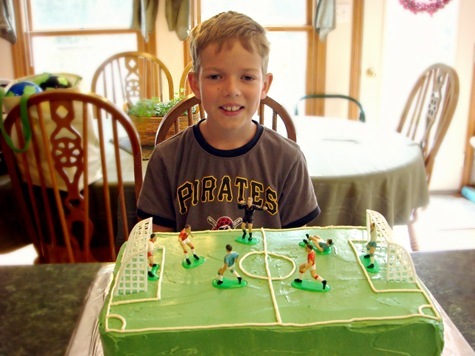 We had a slightly different cake planned for Little A’s birthday party, but with the unexpected hospital stay, we went with something much simpler: a rectangular cake make into a soccer field. 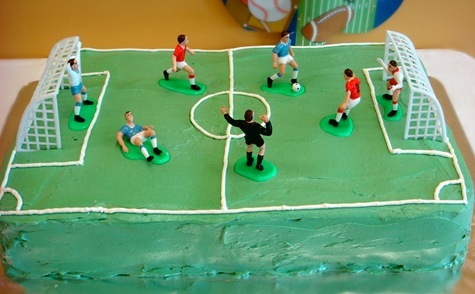 The frosting is a Swiss Meringue Buttercream. It has a few steps, and does require a double boiler (or metal bowl over a pot of water) and a stand mixer. But the result is a wonderfully light, not too sweet frosting. You start with a cooked meringue (one whole cup of egg whites for a regular sized round cake; two cups for the cake we made). This is a fairly large cake (two layer 11×15” rectangle). I had about a cup of egg whites left from making the Vanilla Custard for the Trifle, so I used that plus some reconstituted dried egg whites (Just Whites brand-available in the baking aisle of most grocery stores). Once the meringue has cooked, it is beaten until cool and glossy, then butter is beaten in to make a stable, spreadable frosting. I think this is my new favorite frosting. It was very easy to work with once it was beaten, and it is not too sweet. Now, almost a week later, the frosting is still soft (no crust) and delicious. I love that this frosting gets most of it’s bulk from egg whites, and not sugar (that makes it almost healthy, right?). Just ignore the 4 sticks of butter when you answer that question. I made a raspberry filling for the cake by beating 1/2 cup Raspberry Jam into about 3 or 4 cups of the meringue frosting. It held up great, and did not ooze out at all when the top layer was added. 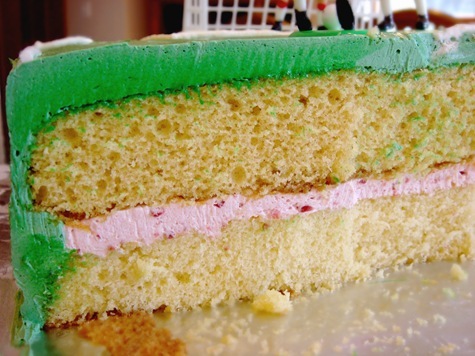 This would make a great all-around frosting as well, if you are looking for a pink cake. I would just use either a seedless raspberry jam, or a lightly sweetened raspberry puree if I was going to put it on the outside of the cake. The little bits of pulp and seeds were fine for a filling, but I would prefer a uniform color for an outside-of-the-cake frosting. Transfer the egg white mixture to the bowl of a stand mixer. With the whisk attachment, whip until meringue is completely cooled and glossy peaks form, about 10 minutes. DO NOT ADD BUTTER UNTIL BOTH THE BOWL AND FROSTING ARE COMPLETELY COOL. Switch mixer attachment from the whisk to paddles. Add butter 1-2 Tablespoons at a time until incorporated. Mixture may appear curdled at times. Continue beating until butter is fully incorporated and frosting is fluffy and smooth. This will take about 10 minutes. Add vanilla and beat smooth. Add gel food coloring and beat until color is uniform. **BUTTER NOTE: butter should be room temperature soft, but not at the point of melting. If the butter is too cold, it will not incorporate well into the meringue, and you will have butter chunks. If the butter is over-soft, it will cause the frosting to curdle while beating-this is okay, it isn’t ruined: it will just take longer (more beating) for the frosting to become smooth. Storage: Store frosted cake at room temperature. To store leftover icing: store in a covered container in the refrigerator. When ready to use, bring to room temperature and beat until light and fluffy. Yield: frosting for a two-layer round cake. For the cake above which is a double layer 11×15” rectangle, double the recipe. Beat with a mixer until smooth. Spread between cake layers. To frost the entire cake with raspberry buttercream, use about 1 cup lightly sweetened raspberry puree or seedless jam (for a uniform pink color with no seeds or pulp pieces) with entire batch of icing above. Makes enough filling for a 2-layer round cake. Thanks. I wish I could decorate cakes as beautifully as you!